When Zoey’s family changes, she must find a way to stitch it together to be stronger than ever in this sweet new Sew Zoey middle grade book. Includes “Sew Zoey” blog posts and fashion illustrations. When Zoey Webber is invited to be a star contestant on Fashion Showdown Junior, it makes news headlines: She’s going to travel the world competing with other young designers…and might even have her own runway show! But there’s even bigger news at home: Zoey’s aunt Lulu is about to have a baby, and Zoey’s dad has finally announced the identity of the mystery woman he’s been dating. Zoey isn’t sure she’s ready for anyone to fill her mom’s shoes, even if she is the perfect fit! But in fashion and in life, unexpected twists can turn into something wonderful. When the fabric of her family changes forever, can Zoey make it work? Hello, readers! I’ve been doing this blogging thing for a while now, and I’ve gotten sew used to telling you guys everything! But occasionally something happens that’s too personal for me to post about. And then I feel funny not telling you, because your comments are always helpful and positive and remind me that one of the biggest perks of being a tween fashion designer is having fans who care! What I’m trying to say is: I got some news that I want to keep a secret for now. It doesn’t even have anything to do with fashion—it just relates to me. (That’s a “punny” clue, BTW!) However, I’m planning to tell my three very best friends today, and I thought, why not make it an occasion? So we’re meeting for tea and scones, and I plan to dress the part, in a full-skirted floral dress with a vintage fedora I got at the thrift store (since I don’t have a proper hat for tea)! Wish me luck! Zoey Webber stood outside her favorite café, Tea Time, staring through the glass door. Her older brother, Marcus, had dropped her off, promising to be back in a little more than an hour. She knew she had to go in, but once she did, she’d have to tell her secret, and she didn’t know how her friends were going to react. She still didn’t even know how she felt about the news! Priti stood up and did a twirl, giving all of them a chance to take in her purple, gold, and turquoise outfit, and sequined headband. It was very typical of the way Priti used to dress, before she’d gone into an all-black clothing phase after her parents’ divorce. “Do you like it?” Priti asked, her cheeks flushed from twirling. Just then a waiter came by to take their orders. Soon, there were scones and personal teapots for each of the girls. “To Priti!” Kate said, raising her teacup. They all clinked cups. Zoey took a sip of her oolong tea. She was spreading clotted cream on a scone when she realized all three of her friends were staring at her. “What is it? My hat?” she asked, assuming that’s what they were looking at. Zoey blinked. She couldn’t believe it. She’d forgotten the whole reason they’d come for tea because of Priti’s bright colors and sequins! “Oops!” Zoey laughed. “?‘The power of distraction,’ as my dad would say.” She paused, and Kate, Priti, and Libby continued to watch her intently. Now that the moment had arrived, Zoey wasn’t sure she was ready to share the news. The jaws of her friends dropped open. Luckily, none of them had been chewing anything. Seeing the shock on her friends’ faces was incredibly helpful. Ever since she’d found out, Zoey had been in a state of semi-shock herself. After all, she had a somewhat special friendship with Esther Austen, who’d always been so supportive of Zoey’s blog and had made it possible for Zoey and her friend Sean Waschikowski to start the Fashion Fun Club, among other things. Realizing that Ms. Austen had been secretly dating Zoey’s father for a while now just made everything feel complicated. Yes, that was how Zoey’s dad had explained it. It just happened, he’d said. “And she’s got great taste in clothes,” Libby added. Zoey went on to explain that lately, Ms. Austen had been showing up at the house in increasingly casual clothes. Like the past Sunday, when she’d come over early to join the Webbers for their regular Sunday pancake breakfast—the secret ingredients were bacon and blackberries—and had worn workout clothes with her hair in a messy bun and no makeup on. “I mean I barely recognized her!” Zoey said. “Hold on! Is our principal going to be your stepmom?” Priti asked. Zoey shook her head. Her dad and Ms. Austen had told her and Marcus a few months ago, but Zoey didn’t want to tell anyone at first. When Marcus came to get Zoey, she hugged her friends good-bye. She had to get home to work on a science fair project that was due in a few days. “Hey, Zo! Did you guys have fun?” Marcus asked. Zoey smiled. Even though her brother was a few years older, he paid a lot of attention to her and gave her rides. She knew some brothers wouldn’t bother to be so nice to a little sister. He was right, of course, but Zoey also thought it was probably normal to struggle with the whole thing. She tried to distract herself by checking her phone for e-mails. She had just opened the mail app when they turned onto their street. How are you? It’s been too long! I’m writing to tell you that due to a delayed start on our next season of Fashion Showdown, we’ve decided to do a last minute mini-season, just for teens! It’ll be called Fashion Showdown Junior, and we want you to be a contestant! It starts ASAP, and the best part is that each episode will take place in a different fashion-forward city around the globe (we start in Paris, then Milan, Tokyo, and Shanghai! ), culminating in a runway show in NYC! We’ll do all the filming in two trips of about six or seven days each. We hope you’ll join us! Have your dad get in touch, and we’ll fill him in on all the details. Zoey dropped her phone into her lap. Fashion Showdown Junior? World travel? Zoey looked up and realized they were home and she was sitting in the parked car with her seat belt on. Marcus had already gotten out of the car and was looking at her like she was on another planet. And she was. Zoey and Marcus found their dad in the kitchen . . . with Ms. Austen. Zoey’s face briefly fell. She wanted to tell her dad and brother alone and hadn’t planned on Ms. Austen being there. It just felt . . . awkward. When she told them about the e-mail, Ms. Austen’s face lit up immediately. “Zoey! You’re going to be a contestant? I love that show, you know. I’ve watched it religiously ever since you were a guest judge.” Then Ms. Austen came over and hugged her, and Zoey couldn’t help feeling warmed by how enthusiastic she was. Zoey felt immensely grateful to Ms. Austen. Her dad had let her take a few trips to New York with her aunt Lulu, but to get his permission to travel internationally would be nothing short of a miracle. Zoey laughed. She was glad he seemed to be recovering after his breakup with Allie Lovallo. But she couldn’t help feeling hopeful. Her dad’s answer wasn’t a firm no, so there was the possibility it could be a real yes. And it was thanks to Ms. Austen. Chloe Taylor learned to sew when she was a little girl. She loved watching her Grandmother Louise turn a scrap of blue fabric into a simple-but-fabulous dress, nightgown, or even a bathing suit in an instant. It was magical! Now that she’s grown up, she still loves fashion: It’s like art that you can wear. Chloe has written more than thirty books for children and lives, writes, and window shops in New York City. Nancy Zhang is an illustrator and an art and fashion lover with a passion for all beautiful things. She has published her work in the art books L’Oiseau Rouge and Street Impressions and in various fashion magazines and on websites. Visit her at Nancy-Zhang.com. She lives in Berlin, Germany. "An aspiring fashion designer is the affable heroine of this first book in the Sew Zoey series. . . . In a smoothly written story of overcoming challenges with ingenuity and style, Taylor shows a knack for characterization and dialogue, and her detailed descriptions of Zoey’s designs will entice young fashionistas." "Most novels about fashion end up being more about little divas than about the clothing; this is an exception. This story celebrates the rewards of personal creativity and risks of self-expression. . . . This book will appeal to a middle-grade crowd that isn’t into vampires and dystopias, as well as to those who create art with their hands." "Zoey Webber is a funky fashionista stuck in a gray-polyester-uniform world. 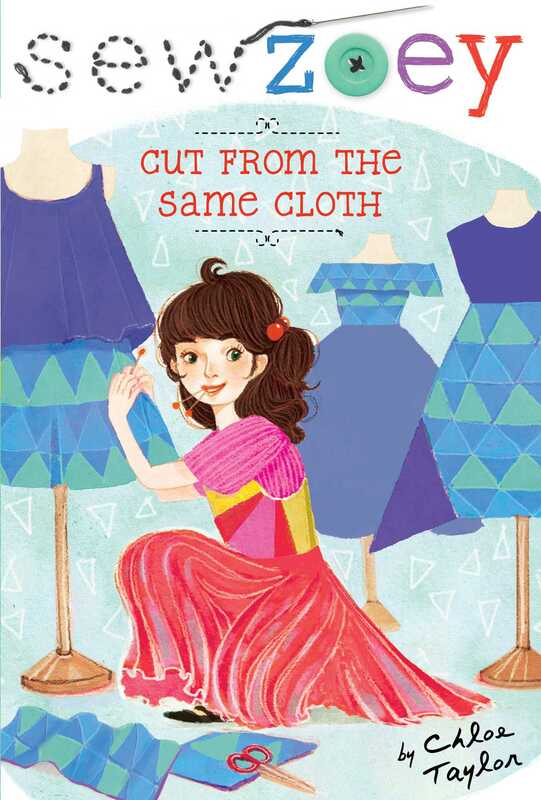 The first book in a delightful new series, this will appeal to any girl finding her own style. Zoey is a bubbly and vivacious character who doesn’t let insecurities take command." "The characters are enjoyable and well developed, and the plot is humorous and entertaining. The black-and-white drawings that open each chapter add a bit of fashion flair. With a touching ending that will leave readers with a warm, fuzzy feeling, this novel will appeal to young fashionistas." Zoey is back and still sewing and blogging in the second book in this upbeat series. . . . When she comes to the conclusion that she has to patch her friendships in the same way she patches her torn jeans, determined and creative Zoey reweaves both friendships and makes them stronger.